Cakie has really taken on board the fact that it has been her birthday. So much so that every day she says “appy birfdaay asshhie” to herself and has even learnt the words to “Happy Birthday to you” which she can sing (pretty much in tune!) all by herself. 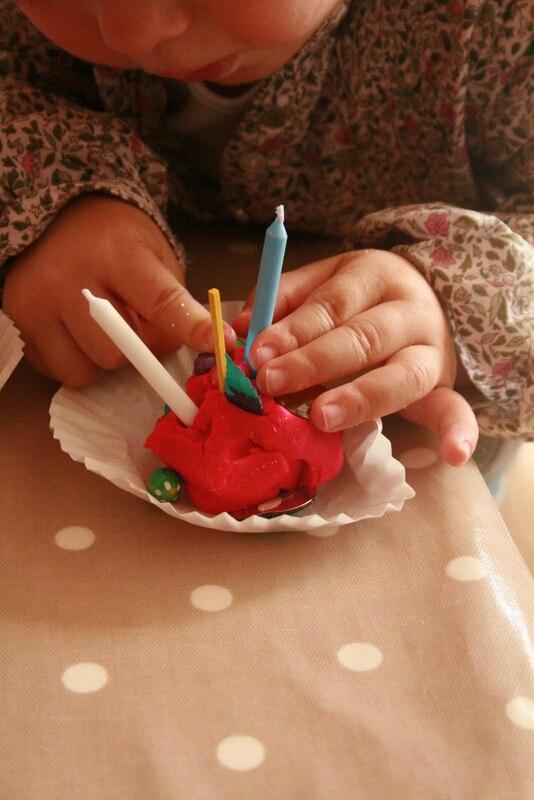 So today we kept the birthday theme alive by making some play dough cupcakes. 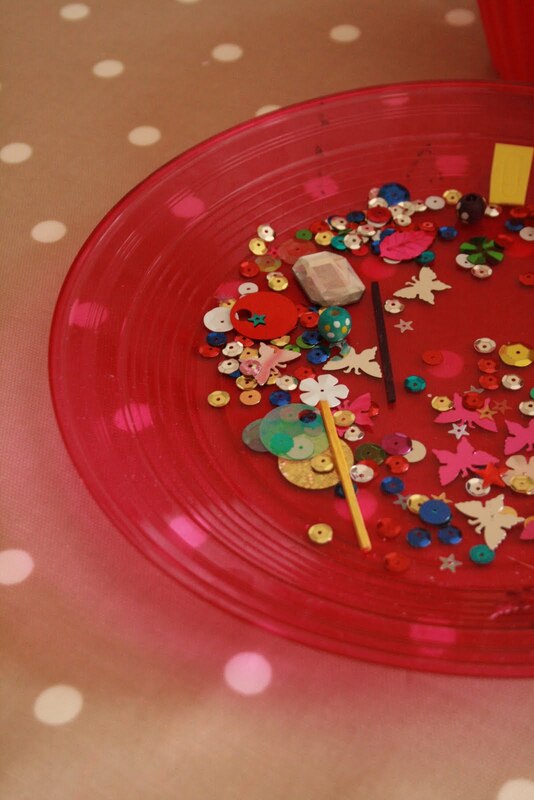 We gathered lots of sequins, plastic jewels and wooden beads and spread them out on a plate. She started to squeeze and squish them into 2 balls of play dough (ELC Soft Stuff this time, not home made!) I gave her 2 muffin cases to put them into. 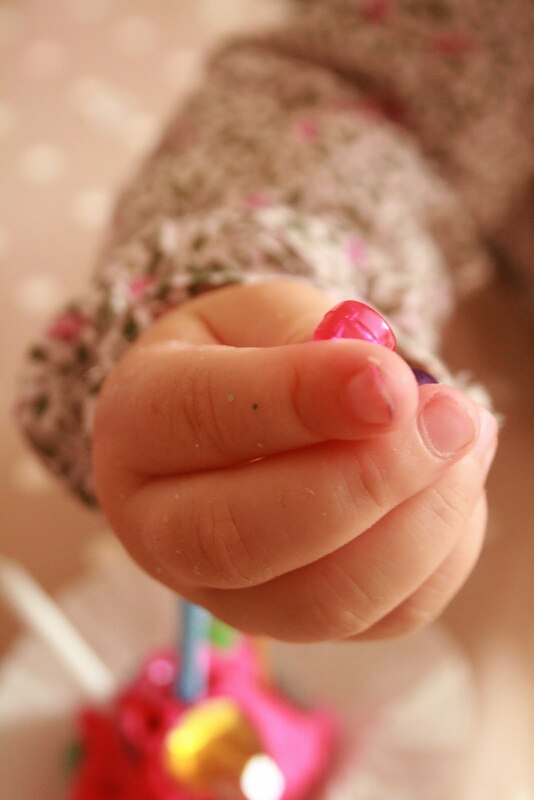 Developing the pincer grip again and strengthening up those small hands muscles. She used some candles to go on top. 2 for 2 years! Look at those little pursed lips revealing such purposeful concentration! 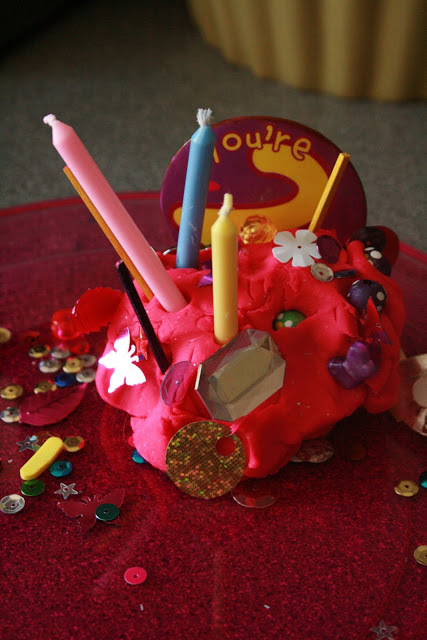 Stick in a birthday badge for good measure and VOILA! What a delicious looking cake! 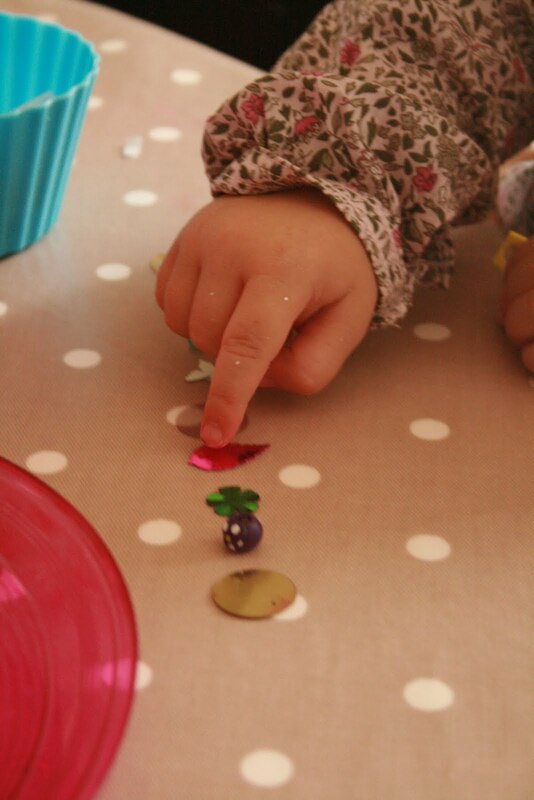 Counting out sequins and beads to add to the learning experience. The counting went something like this…. “seven, EIGHT, nine, TWO, seven, EIGHT, nine….TEN! !” And copious amounts of self-congratulations followed. It’s exciting stuff all of this learning! 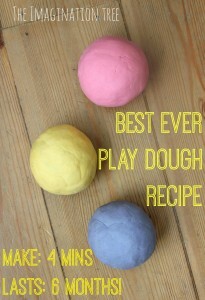 Best Ever No-Cook Play Dough Recipe! Intentionally commenting to say how cool this is. 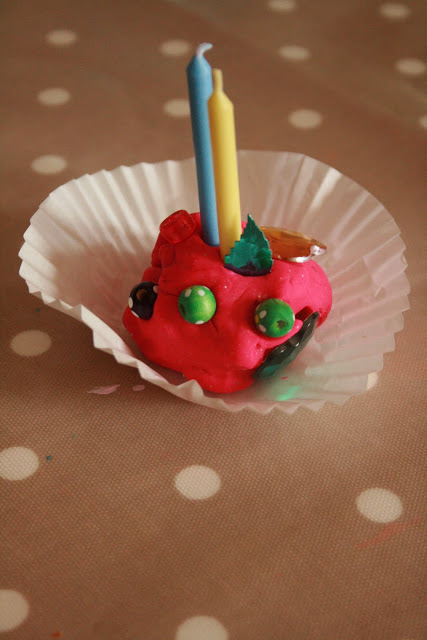 Might try this – see the piccies on FB of our actual cupcake making session. Resulted in two bags of caster sugar upturned while my back was turned. Despite sweeping and mopping furiously the floor is STILL sticky! 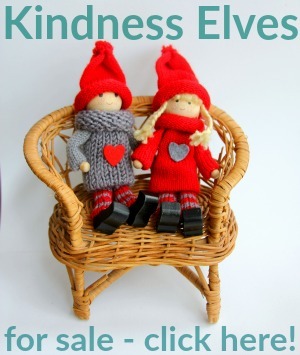 I love your blog Anna, it is so delightful. Your photos are wonderful too. Thanks for commenting and for the encouragement! This is brilliant! 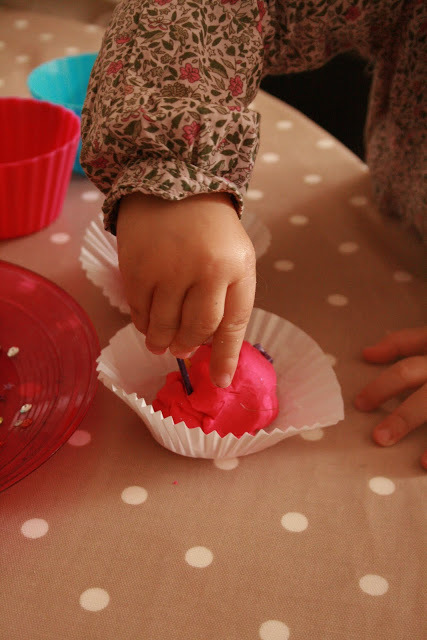 My kids would absolutely love making their very own cupcakes! This is a super idea, thanks for sharing! 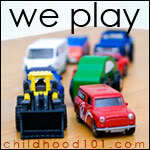 I think it would be nice with a batch of vanilla or chocolate scented play dough, don’t you? 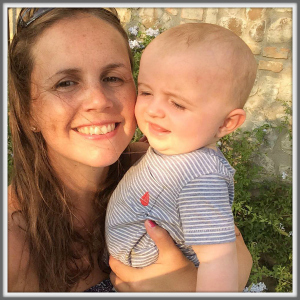 Discovered you via ABC 123 – so glad I did! Oh yes, it would be even better with scented dough! Yum. Thanks! super cute idea! thanks for the idea! Oh they look scrummy! Just want to have a good bite of that!! Hope to “see” you later? What an adorable project, I bet it was a big hit. I love seeing those precious little baby fingers hard at work. Thank you for joining us at Show & Tell on ABC & 123: A Learning Cooperative! Hi again! Just popping in to say that I did this with my daughter this morning and we had a blast! 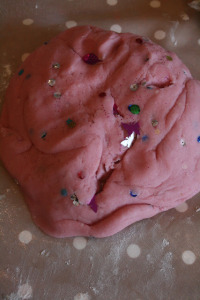 I scented the dough with vanilla and cinnamon, and added glitter to one batch. 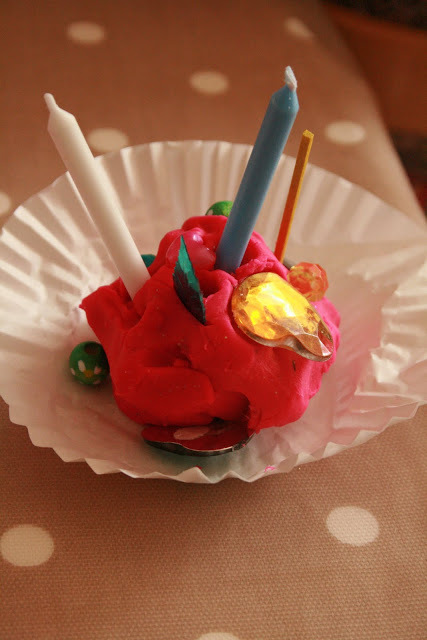 I linked back here from my post – please come visit and see how ours turned out! 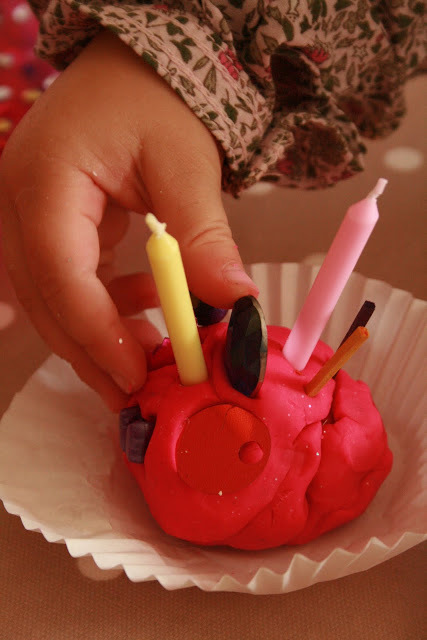 http://joyfulmamasplace.blogspot.com/2010/09/playdough-cupcakes.html Love from South Africa! Me again! We’ve been having so much play dough fun following this little exercise, that I declared Thursday 23 September JOYFUL MAMA’S PLAY DOUGH DAY! 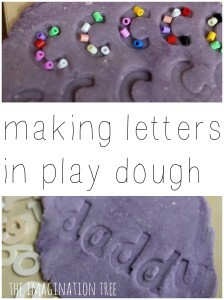 Please visit http://joyfulmamasplace.blogspot.com/2010/09/oh-to-play-with-dough.html to see how you can join in the fun! So gorgeous and what concentration, we love birthdays here too.